Please Note that from the 1st of May the regulations on the Eucmbene and Thredbo Rivers change. You may only take 1 trout per day over 50cm in these rivers, from this date, till they close completely at the end of the June long weekend. The Eucumbene River upstream of the flying fox and all tributaries of the Eucumbene River are also totally closed during this period. The browns are really starting to get into spawn mode with several fish having been seen pairing up and digging redds. 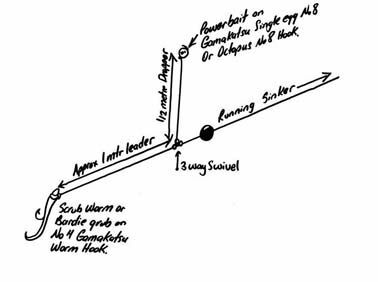 With cool nights the warmest time of the day is more likely to produce hatches and there fore a better chance at finding feeding fish. Make the most of the good conditions while you can before the rivers close next month. If we do get some rain and the weather turns cold a nymph & glo bug under an indicator will work well. Best flies were pheasant tail's, hare and copper nymphs ,stimulators, adams, royal wullfs, humpy's and klinkhammers. Lake Eucumbene:- The river mouth area has been the best bet. With some nice browns coming in on wets fished after dark. The fish have been coming on quite late at present and you do need to put the hours in, but there is always the chance of a very big fish. Keep an eye on the weather and look for rain. Other anglers reported some nice rainbows to 1.5kg at Middlingbank on Wollondibby wonders. Jindabyne has been the jewel in the crown for lake flyfishers at present. With good weed beds in many areas there are plenty of fish moving around in close after dark. Most areas in the lake are producing fish. Best flies have been muddler's, woolly bugger's, Lumo baby doll's, and fuzzy wuzzy's. Eucumbene:-Still continues to produce good numbers of fish.Both flat line and lead line trolling have been consistant. Best lures have been Colours Y82, S12, and Y05 in Tassies, Rebel crawfish and Crickhopper's have also taken some good fish. Baby Merlins in trout patterns and fire tiger. Jindabyne:- Has been fishing very well and should only continue as things cool off.Again both flatline and leadline trolling has been consistant.Running some deep divers like Merlins and Stump Jumpers is another way of finding a larger fish.Tony Pizzano from Canberra fished flatlines with X4 Flatfish in Perch Scale pattern for two 2.5 kg browns and dropped a couple more fish. Some excellent reports from Eucumbene, Jindabyne and Tantangara over the last few weeks. Power bait in orange, rainbow and lemon twist were the main fish takers.The best rig for this is using scrubbies with a Power bait dropper (pictured below). This rig has really proven itself over the last few seasons; with both options you really have it covered.Power bait naturally floats, so the distance you make your dropper is the distance you can expect your Power bait to be above the bottom. This means that fish will find your bait a lot quicker even if you have cast into weeds. If they don't eat the Power bait they have found your main bait a lot quicker. The hook is important when fishing with Power bait and we get a special "single egg" pattern in from Gamakatsu just for the job - which has a short shank and ultra wide gape. Feel free to ask us to go over the rig next time your in if still unsure.Please also note that we haven't been able to secure any more bardie grubs and will let you know once we can find a supplier.